The Naples Art Association presents a community favorite event on Jan. 5-6, 2013 on Fifth Ave. South: the Downtown Naples New Year’s Art Fair. At this festival, audiences can walk right up to life-size sculptures, try on handmade clothing, view memories of places and things captured by camera or paintbrush, oogle jewelry that sparkles, select from an array of functional pottery and decorative ceramic art. More than 200 artists will have their original artwork for sale. The festival on Fifth Ave. Naples is open from 10 to 5 both Saturday and Sunday. Saturday only, check out Art in the Park along Park Street for even more original art by Naples Art Association member artists, art demonstrations by Sharon Erbe and Rinny Ryan, plus art projects for the whole family! First Saturdays art projects will take place from 11 a.m. to 2 p.m.inside The von Liebig Art Center. Instructor David Hammel will lead adults in glazing ceramic bowls to donate to the Empty Bowls fundraiser, helping to feed the hungry in Collier County through Harry Chapin Food Bank. Instructor Kim Walbert leads children of all ages to create make-and-take art projects. To support the Naples Art Association’s ongoing, community-supporting arts programming, donations are accepted at the festivals, but admission to both events and participation in First Saturdays craft activities are absolutely free. Special thanks go to sponsors: Costco, Russell’s Clambakes, Naples Daily News, WAVV 101.1, Happenings A&E Magazine, Lite 93.7, Florida Weekly and WGCU Public Media. Four out of five Naples Art Association fine art festivals are ranked by Sunshine Artist Magazine’s 100 Best Fine Art and Design Shows of 2011. Rankings are derived from magazine subscriber artist ballots which ask artists to rank their top 10 festivals by sales. Nearly 1,000 art shows were submitted. The association’s top ranking festival is the Naples National Art Festival. This festival was ranked #9 for 2011 and has earned a place on the top 10 list dating back to 2007. This annual festival serves as the association’s largest fundraiser. 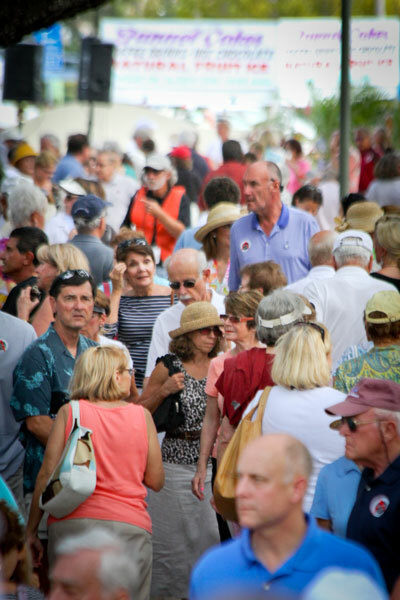 The 34th Annual Naples National Art Festival is scheduled for Feb. 23-24, 2013 in Cambier Park and along 8th Street in Naples. Executive Director Aimee Schlehr notes that festival artists are both creative individuals and small business owners. She says this duality helps artists and arts organizations succeed. “Naples Art Association festivals offer the community a great way to discover new artists, but they are also fundraisers for us aligned with our vision of supporting individual artists of all levels to further their creative goals,” Schlehr said. Drawing crowds in the tens of thousands, NAA festivals are strongly supported by the community. They aim to put on events that exceed the expectations of fine art collectors and energize the attendees viewing art of all varieties. The association’s two festivals held along 5th Avenue South in Naples, The Downtown Naples Festival of the Arts, and the Downtown Naples New Year’s Art Fair, were ranked #21 (rising three ranks from 2010) and #63 respectively. These events are scheduled for Mar. 23-24, 2013 and Jan. 5-6, 2013 and will showcase approximately 250 national artists. The Mercato Fine Arts Festival, which is the association’s newest art fair, earned a ranking of #73 (rising two ranks from 2010). The 5th Annual Mercato Fine Arts Festival is scheduled for Mar. 2-3, 2013 at the Mercato Lifestyle Center in North Naples. Although the association’s smallest and first festival of the season did not make the Sunshine Artist Magazine top 100 list, the Naples Fall Fine Art and Craft Festival draws about 100 artists from around the country. Now in its 9th year, this festival is an excellent kick-off to the holiday shopping season. Nestled along 10th Street South in Naples near The Depot, this event is scheduled for the Saturday and Sunday after Thanksgiving, Nov. 23-24, 2012. All five festivals serve as fundraisers that help support creative community programming of the Naples Art Association, a 501(c)3 nonprofit organization.